2 Usage Instructions – For All Programs / GPS. The maps offered here are to be used for recreational / touristic cycling and/or roadbiking. There is a general preference to route you small streets and cycleways. Streets have lower priotriy. However note that the GPS will not take huge detours on trails to avoid a primary or secondary highway – even though they have the lowest priority. Autorouting with my maps is unusable with a motorcar. Use another Openstreetmap implementation instead if you intend to use your car. Please note, the instructions below are only valid for Velomap – other maps might behave differently. Also note, never have to different maps, which both offer Autorouting, enabled on your GPS device. In that case routing results will be erroneus or bogus (or failing). As the format of Garmins new maps with Activity Routing is not known, I have tweaked the maps to give similar or better results, by tricking the maps in such a way, that cycle routes are like interstate highways, while primary or secondary big roads are residential roads for the routing software. Therefore read carefully (actually the results you can achieve with my maps, are far superior for cycling, compared to any Garmin map as of 2012 (and Velomaps offer routing for bicycle since 2009, so long before Garmin copied it)). In general as of summer 2015 I advise to use Dirt-Biking (best) or ATV (still very good) as autorouting profiles (and watch out for avoidances – you need to configure them specially)! Usage Instructions – For All Programs / GPS. I’m not sure where and how to classifiy Nuvi and Zumo devices. I think most fall into Class 1. Etrex 10/20/30 also belongs to this group, however only has very limited activity routing support (only Automotive, Bicycling, Pedestrian). All other Class 2 devices, should support all Activity Routing Profiles. In Class 1, there is still one Distinction. 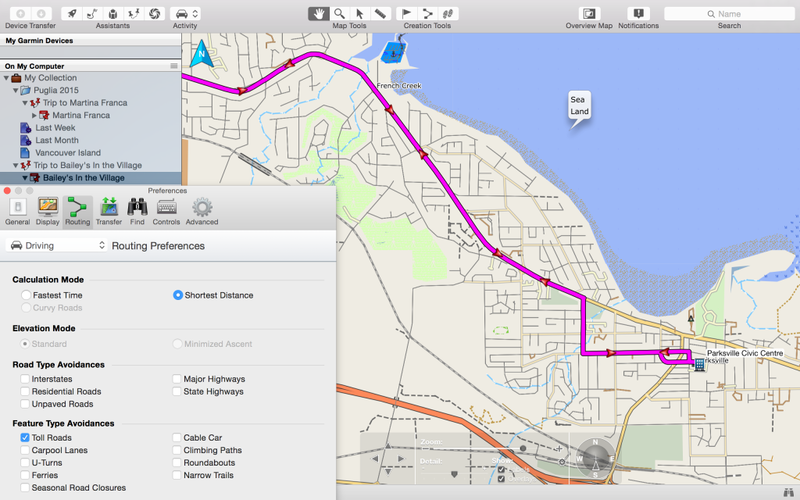 In Mapsource under options/autorouting you have a slider to prefer small roads (left side) to highways (right side). If you move this slider to the right hand side, better suited ways/streets will be preferred. On the GPS such a setting does not exist, but the GPS is anyhow more strict on choosing well suited roads. On the other hand the “route calculation method” is only available on the GPS. With my maps shorter distance already tries to route over nice ways. If you use “faster time” – especially in combination with car/motorcycle or Automotive mode, then an even higher preference for “nice” ways will be used and routes tend to be longer (more detours) overall. With my maps there is no such routing as really shortest distance (it is actually impossible to do really have autorouting on Garmin GPS find the shortest route over long distances). If you use shorter distance the route will be in general straighter and with less detours – also longer overall distances will be calculated without crashing (error notice, no actual crash). Garmin is not supporting proper Arrival times for Cycling. Using bicycle the estimated arrival times using “faster time” are simply calculated by averaging 18km/h – hence not very useful. Using “shorter distance” the arrival time often becomes really bogus. Using Automotive, Car/Motorcycle or other modes, the times will be far too short. Also elevation (so climbs or downhills) are not taken into the calculation. This is the same for Garmins own maps. Basecamp v3.3 and above, as well as GPS Devices with Activity Routing, behave quite differently to previous versions, or Mapsource, and also on the internal side of how it checks the maps, and what it does is very different. So Let’s have a look on what you can set. 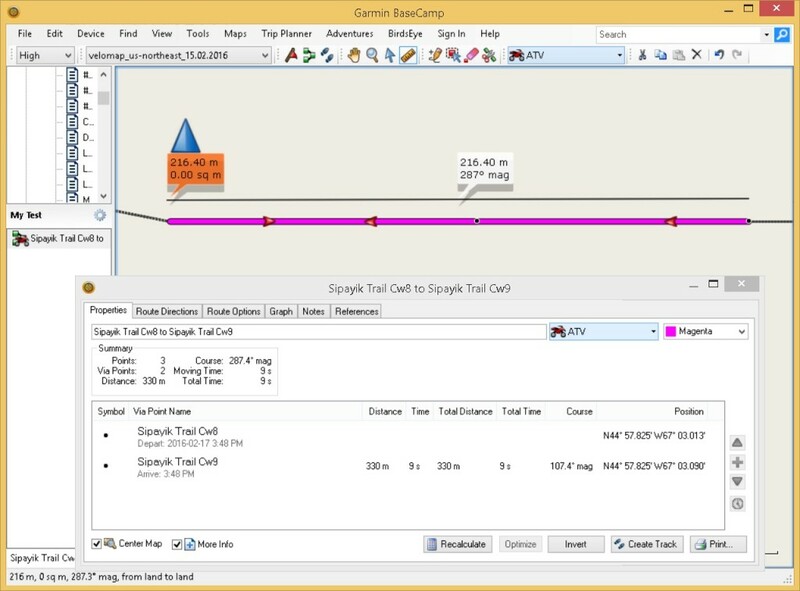 In Principle (except for etrex 10/20/30) the GPS devices behave very similar to Basecamp v4. Automotive and Motorcycling have been the method of choice for Basecamp v3 and Mapsource – but are not really usable except for short distances with VeloMaps in Basecamp v4 and newer anymore! On etrex and 62s series – where you cannot choose ATV as routing mode – use car or bicycle. Then there are several Bicycling, Mountainbiking, Group Cycling (and maybe more in future) options. With the VeloMap – if you configure the avoidances the same, they all route alike. These modes are okay, if you don’t mind to find yourself quite often on asphalt and streets. They do tend to often use bigger streets with newer firmwares though or in Basecamp v4. ATV and Dirt Biking Route pretty similar – Dirt Biking gives the best routes and can route over very long distances (>100km by air without any intermediary routing points). However Dirt Biking is not available on most GPS devices – while ATV is (e.g. on most Oregon/Montana and maybe Dakota/64s?). Therefore you can chose between ATV – which is the best choice if you want to transfer the route itself to your new generation device – and Dirt Biking, which you can use for best routes that you copy via right-click advanced to a track – and send the track to your device (except of course if your device supports Dirt Biking profile – then go for it in any case). Hiking, Walking, Mountaineering also all behave alike –> The results are okay for short distances with the Velomap – over long distances however it seems to use the worst streets/ways for cycling (mainly primary and secondary roads). Interstates: I have put cycleroutes high priority into my maps. If you tick “avoid Interstates” then this high preference is largely reduced. Never tick it if you you like cycleroutes and don’t mind the occassional detour it takes to stay on a cycleroutes. If you are however a roadbiker, and your main aim is to cycle fast and improve your fitness, then you can tick this box, and you’ll be mainly routed over unclassifed and tertiary streets. Major Highways: If you tick it you will avoid streets that are nice for cycling, cycleways, cyclepaths, and so on. Well as you want to cycle with this map, I don’t think you ever want to tick that box. State Highways: Don’t tick it. Most ways in the Velomap would be blocked. Residential Roads: If you tick it, then actual highways where cycling is allowed, are avoided (primary and secondary streets that have no cycleways), as well as actual residential roads. For roadbiking this might make sense. For recreational cycling, don’t tick it. Unpaved roads: Does what it says and avoids unpaved roads. However also avoids ways that are not good enough quality for a racing bicycle with slick tires (sometimes this fails because of missing/wrong OSM data or tags). Also avoid ways, where cycling is forbidden, but thought to be still possible. (e.g. a primary road, where cycling is forbidden). Toll roads Avoids ways not suitable for a trekking bicycle. Note really difficulty ways like via ferratas, difficult alpine ways, or difficult mtb trails are not routable anyhow. In General this avoids ways with tracktype 5 or above, or mtb:scale>0 or sac_scale mountain_hiking or above. Note that the ways avoided, are of very low priority, so usually never taken. Avoid Ferries – Avoids ferries, cablecars, gondolas and mixed lifts. U-Turns avoids any turn over 120° – best not use, because it will destroy sensible autorouting. Cable Cars: Does not matter with Velomaps (or better, does not work, best don’t tick anyhow). Narrow Trails: Does not matter with Velomaps. Carpool lanes: Avoids all ways where cycling is forbidden (and no more). Date and Time Closures – it is currently not possible with mkgmap to produce maps that react to this setting. Climbing Paths: Does not matter with Velomaps. Roundabouts: Well does exactly what it says. I advice you to never tick this box, else roundabouts are avoided, and then routing likely won’t work well. For roadbiking: Use Dirt Biking / ATV as transport mode if available (or else try car or bicycle), tick “avoid toll roads”, tick “avoid unpaved roads”. Play around with avoiding Interstates as well as Residential roads to your liking. Shorter Distance no detours, faster time for nicer roads. For commuting: Use Dirt Biking / ATV as transport mode if available (or else try car or bicycle), shorter distance, and don’t tick any avoidances. For recreational cycling / trekking / touring: Use Dirt Biking / ATV as transport mode if available (or else try car or bicycle), faster time, and tick “avoid toll roads” if you hate to very very occassionally need to push your bike, because a short stretch of the track is not nice for your rather slick tires. — As the map data in Openstreetmap is everywhere different, and also the offer of good ways/routes for cycling differs a lot, just try around a bit in Basecamp, to find out what happens. In General Basecamp and your GPS will route similar over short distances. Car/Motorcycle = Works well on shorter distances – might produce long detours. Routes over All Roads and Ways exactly like Bicycle. Bus / Truck = Avoids turning. Hence don’t use it. Pedestrian No good autorouting over longer distances, will usually give quite direct vias – does not respect oneways. Bicycle = Works well in combination with “shorter distance”. 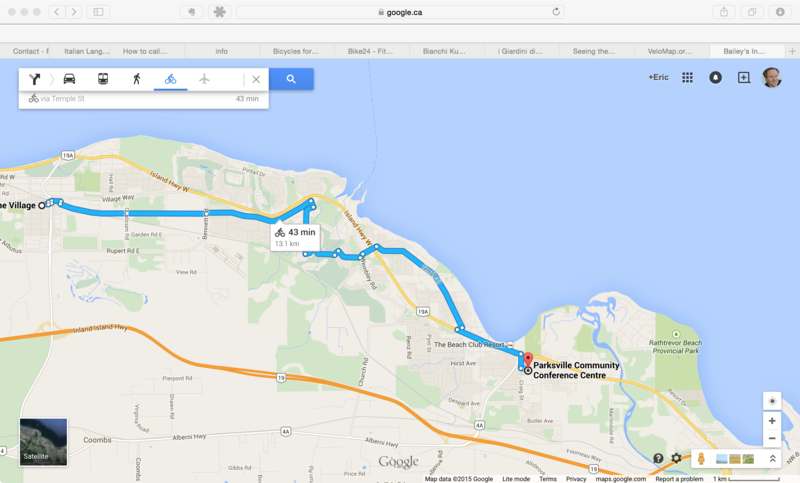 Is good for calculating longer distances on you GPS if you get “out of memory” errors. Routes over All Roads and Ways exactly like Car/Motorcycle. Avoid toll roads Avoids ways not suitable for a trekking bicycle. Note really difficulty ways like via ferratas, difficult alpine ways, or difficult mtb trails are not routable anyhow. In General this avoids ways with tracktype 5 or above, or mtb:scale>0 or sac_scale mountain_hiking or above. Note that the ways avoided, are of very low priority, so usually never taken. Avoid unpaved roads: Does what it says and avoids unpaved roads. However also avoids ways that are not good enough quality for a racing bicycle (sometimes this fails because of missing/wrong OSM data or tags). Also avoid ways, where cycling is forbidden, but thought to be still possible. (e.g. a primary road, where cycling is forbidden). Carpool lanes – does nothing. Note the slider called “Road Selection”. The more towards the right (prefer highways) you push it, the more you will be routed over Cycleroutes and Cycleways. Never move it to the left. If you feel that cycleroutes are favored too much, better use transport mode: bicycle, or use “shorter distance”. NEVER Tick “Avoid Highways“ – It will block the best ways. On my maps, shared use pathes and cycleways are encoded for the GPS as highways. Real highways or big streets where cycling is not allowed are not routable anyhow with the Velomaps (so no need to avoid them). Route Calculation Method: Per default I would advise to use “quick”. However if you get “out of memory” errors, go for “better route”. On best route calculation is able to get you to pretty remote places, however you might need to wait up to 10 minutes or longer until the calculation is actually finished. Route Calculation Percentage value – The indicator has a bug on all units. It is only correct if jumping by several percent. However if it only increases by one percent per second, then it will reach 100% long before it has calculated the route. Hence when it gets stuck at 100%, there is still a good chance that the route can actually be calculated correctly. Using “better route” or “best route” for route calculation method, this often means waiting 3-5minutes until the route is actually calculated. For roadbiking: Use “Bicycle” as transport mode, tick “avoid toll roads”, tick “avoid unpaved roads”, and use shorter distance/faster time to your liking. Maybe if you don’t mind very few times to cycle on gravel, then don’t activate “avoid unpaved roads” – they won’t be frequent. for recreational cycling / trekking / touring: Use Car/Motorcycle, Faster Time, and tick “avoid toll roads”. 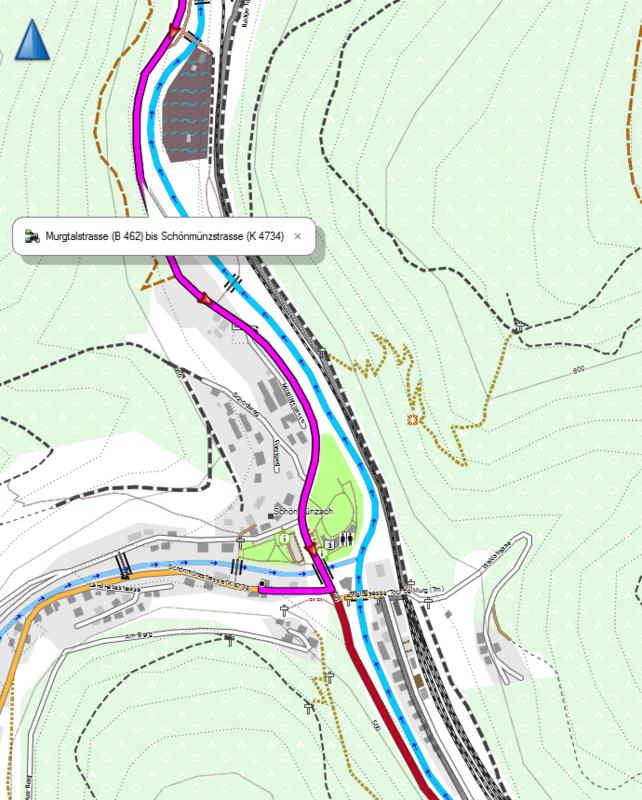 — As the map data in Openstreetmap is everywhere different, and also the offer of good ways/routes for cycling differs a lot, just try around a bit in Mapsource, to find out what happens. In General Mapsource and your GPS will route similar over short distances. If Routing fails and you need to get somewhere without being able to set via points, you can try with “shorter distance” caculation which should autoroute even through heavily mapped cities (actually the better a region is mapped, without sufficient bicycle/mtb routes the more difficult it is for the routing engine to get over longer distances, Enabling “shorter distance” instead of “Faster Time” gets you to your destination quite well (though then also big streets are chosen quite often). Due to the way the maps are setup, setting your GPS to “shorter distance” should generate routes that are much quicker. “Faster Time” calculates nicer routes, but will take much more time. It it fails with “out of memory” error, you can also change the route calculation method. Another possibility to to deactivate “avoid unpaved roads”. Often some very small patches of unpaved roads will hinder the routing to work well. Then just try to cycle a bit nearer using the route, and after a few kilometers (or better say 20 turns) click on recalculate after reactivating avoid unpaved roads. There are two main causes for bad routing: 1. non connected streets in OSM. 2. Not enough streets suitable for cycling – or tracks and pathes that are not tagged with tracktype/smoothness so that they are blocked when using “avoid unpaved roads”. You should be able to route for 15km minimum to about 70-80km maximum without needing to route over via points on old GPS. Using Mapsource or newer GPS like Oregon or Dakota you can route over much longer distances. Very very long routes will never work because the routing engine of Garmin is not strong enough (and maybe there are still some improvements to be made in mkgmap). This is because Garmin algorithm likes to go straight for long time (like on a motorway) – routes suitable for cycling or mountainbiking make turns, have many intersections and are not so easy to be routed on. Because I don’t want the maps to send you onto big roads, routing will not work over long distances. For autorouting inside your car there are better maps available. Maps offered here are supposed to give you the best routing possible on Garmin GPS for mountainbiking / hiking or cycling. Solution: Insert additional via-points. Routing without via points over large distances (i.e. 50-100km) will often not work, even though by setting via points you will find a way. The better the OSM Coverage the greater the distance you can cover with the autoroute function. For in car use I recommend either Garmin City Navigator maps if you have the doll to shell out, or the excellent Autoroutable maps by Lambertus: http://garmin.na1400.info/routable.php The maps offered here are to be used for cycling, commuting via bicycle and roadbiking. I have structured the Routing Preferences so that small streets are preferred over larger streets. If you want to plan you’re routes in Mapsource and be sure that recalculation works on GPS I recommend you to read through here: plan-routes-efficiently following this tutorial and using wingdb you can easily create routes via pc that go over 200-300km. I advise however to make a new route for each day. Ich hab das absichtlich geändert – weil ich dachte es hängt mit gelegentlichen (sehr selten – aber reproduzierbar) Abstürzen beim Autorouting zusammen – sicher ist es jedoch nicht – es könnte auch an einem anderen Fehler (teils OSM, teils mkgmap) dort gelegen haben – und trat bei Kreisverkehren vermehrt auf. Ich bin mir 90% sicher es lag nicht an der Kreisverkehrskennzeichnung (Typ) – und ich könnte es wieder als echten Kreisverkehr eintragen in der Karte und bin mir unsicher ob die Anweisung so wichtig ist vs potentiellen Absturz (auch wenn sehr sehr selten). Abstürze sind natürlich immer doof, andererseits sind die doppelten “Rechts abbiegen”-Hinweise verwirrend, insbesondere, wenn es um den Kreisel erst einmal 270 Grad herumgeht und man somit eigentlich links abbiegt. In Ländern wie UK mit den vielen auf der Straße aufgemalten Minikreiseln stelle ich mir das noch lästiger vor. Wäre klasse, wenn Du die Ursache der Abstürze finden und sie irgendwie umschiffen könntest. ich hatte folgendes Problem(Garmin etrex Legend HTC) dass es bei gesuchten Ortsnamen nichts angezeigt hat bzw die Ortsnamen waren mit versch Symbolen zusammen gesetzt(Ähnlich wie die Winding Schrift. Wenn ich aber dann direkt in der Karte gesucht hatte war der Name richtig geschrieben. Da muss ich bestimmt am GPS was umstellen? Ist dass eine Karte mit Update 17.08? Ich hab da in der VeloMap riesig was verbuggt – ich suche grad nach dem Fehler und lasse die Karten neu berechnen. Das Legend HCx nehme ich mal an, ich kenne kein HTC ist halt sehr alt. Wähle da evtl mal die Non Unicode Version wenn es eine Unicode Karte war – um welche Karte genau geht es da? Leider funktioniert das Autorouting mit Basecamp 4.6.2 über das Profil Dirtbike nicht. Woran kann das liegen. Profil Tourenbike funktioniert einwandfrei. Kann teils an der Wegestruktur im Gebiet liegen – du müsstest dann mehr Zwischenpunkte setzen. 100km ohne Viapunkte wird gar nicht gehen – aber eine Route von 200-300km mit Viapunkten ist schon möglich. Am besten bei langen Touren pro Tag eine Route erstellen. Die Komplexität ist einfach viel höher als bei PKW Routing, und Basecamp hat dafür auch einfach den falschen Algo. Ich habe die aktuelle basecamp version und alle Einstellungen vorgenommen so wie oben beschrieben. Leider habe ich das Problem, dass das Autorouting fast nie Fahrradwege direkt neben/ an den Straßen berücksichtigt. Ich muss die Route immer manuell auf den Fahrradweg ziehen. Ist das normal? Denn ich fahre auch mit dem Rennrad lieber auf dem Radweg neben der Straße als auf ihr. Durch das manuelle ziehen der Route wird der zeitliche Aufwand der Planung um ein Vielfaches vergrößert…. Das finde ich sehr schade. Gibt es dagegen Abhilfe? Fahrradwege die neben Straßen verlaufen sind oft kritisch. Die haben viel mehr Kreuzungen und sind viel ungerader wie die Straße daneben – das führt dazu dass auch wenn sie höher priorisiert ist – einfach nicht gewählt wird. Erst recht in der Stadt (da sind die Fahradwege wenn separat eingetragen meist eh komplett unroutbar – ist ein OSM Problem und wäre besser wenn die Fahrradwege gar nicht separat eingetragen wären sondern als cylecway=track). Du kannst ein bisserl rumprobieren mit den Einstellungen – aber im Prinzip ist es solange es wirklich parallel läuft doch egal. Lass dich auf der Straße routen und fahr halt 5-10m daneben am Fahrradweg. Manuell rüberziehen würde ich nur wenn der Wegverlauf klar anders ist (sprich so dass man es nicht klar erkennen könnte beim entlangfahren). I have encounter a routing anomaly on occasion that I can not explain! When I am routing on some secondary roads or trails and I click two points on the trail, the route goes beyond the second point and comes back to it. see that attached file for an example of this, if it is a problem with the underlying data, I would like to know what I can do to fix it. In the example there is only two points which are only 216m apart, yet the details say that it is 330m in total length, it appears to happen when I click in the middle of a straight segment! That can sometimes happen – as I put several roads on top of each other. It should not happen over longer distances – basically it only happens (and not very often) directly around the place you clicked. sometimes you could avoid it – by clicking besides the road instead of on it – but that makes not much sense when you send such a route to your device – so just ignore it – this error is pretty rare (and I think does not happen on device anyhow – it’s basecamp/mapsource only). Welches Profil ist nun empfehlenswert für eine Radtour? “Motorrad/Auto” und “Kürzere Zeit” mit (bei nicht perfektem Wetter) “Mautstraßen vermeiden”? Bei Motorrad/Auto eher kürzere Strecke – bei Fahrrad kannst auch kürzere Zeit probieren. Da musst du einfach mal ein bisserl probieren. Je mehr Viapunkte desto besser/problemloser gehts. Mautstraßen vermeiden – wenn du schlechte Untergründe wirklich ganz schwarz/weiß schematisch vermeiden möchtest. habe hier mit dem Edge1000 ein Problem mit der Österreich Karte (Version vom 29.07.15). Habe die Karte auf den Edge geladen und das Routing von einem Ort zum anderen funktioniert nicht. D.h. die dicke Linie mit den Abbiegehinweisen erscheint nicht, wenn ich z.B. einen Ort in der Nähe angebe. Wie gesagt, nur in AT. In DE ist alles super. Hat jemand eine Idee oder kann das auch mal testen? Bist du in AT – oder im Simulationsmodus? Wenn direkt dicke Linie kommt – hast du grad evtl Direktouring aktviert statt ein richtiges Profil. Wenn du das nur simulierst – das klappt ab und zu einfach nicht. dank dir erstmal für die Mühe! Schöne Sache das alles und macht viel Freude. Ich möchte Routen in Basecamp fürs Rennrad planen. Das klappt auch alles super (Italien, Südtirol) und ich kann auch in der Grafik das Höhenprofil sehen. Allerdings rechnet mir Basecamp die Gesamthöhenmeter nicht aus. Ich sehe zwar die Entfernung, aber keine Summe der zu fahrenden Höhenmeter. Ist das irgendwie machbar? Das Routing in Basecamp habe ich eingestellt, wie angegeben. D.h. Vermeidung von Autobahnen usw. alles deaktiviert. Fahre ich im Schwarzwald von Forbach nach Schönmünzach routet mich die Openvelomap immer über die Bundesstraße, nie über den sehr gut ausgebauten und geteerten Radweg. Müsste der nicht genommen werden? Der Ausschnitt zeigt das Problem. Rechts ist ein Radweg, der auch als Tour de Murg gekennzeichet ist. Links ist die Bundesstraße. Von der Strecke her, müsste beides annähernd gleich sein, gewählt wird aber immer die Bundesstraße. Teils macht es einfach was es will – dann braucht es einen Zusatzpunkt auf der Route – bzw sie sieh drauf. Wenn selbst das nicht geht – dann ist es meist ein Datenfehler (was nicht richtig Verbunden ist der Klassiker) in OSM. Ich schau mir das Morgen aber mal an – ich nehm an es ist die aktuellste Karte? Klicke in das Diagram rein – und markiere einen Teil/komplett – für die Markierung bekommst du eine Addition. Danke dir! Mit den Höhenmeter klappt so. Nicht unbedingt intuitiv, aber es funktioniert und gibt zumindest mal nen Eindruck von den Höhenmetern. Gute Sache das fürs Alpine fahren. Da kommen bei 80km sonst schnell 3000 Höhenmeter zusammen. Es ist die neueste Karte und ich meine an einer Stelle ist die Kennzeichnung für den Radweg unterbrochen. Der Weg geht zwar durch, aber die Markierung nicht. Evtl. liegt es daran. Zusätzlicher Punkt geht natürlich, aber das da ein Super Radweg ist, weiß ich nur, weil ich den Weg kenne. Ist ein abolutes Highlight im Murgtal und die Straße ist die Hölle. Wenns daran liegt, schau ich auch mal selber ob ich das für die nächste Version reparieren kann. Wenn man durchs Murgtal fährt, muss man definitiv diesen Weg nehmen. Schöner gehts kaum auf dem Renn- oder Tourenrad. In der VeloMap routet es korrekt (mit Fahrzeug Auto – mit Fahrrad bleibt er auf der Straße – wenn du mittig beginnst – mit Startpunkt Schwarzwald Radweg weiter nördlich – immer korrekt). Sprich in der VeloMap schaut für mich alles korrekt aus – da die Brücken meist als Fußweg ohne bicycle=yes markiert sind. Zumindest im Modus kürzere Zeit. Im Modus Kürzere Entfernung hakt es etwas – ich hab es mir gerade in den Rohdaten nochmal angeschaut – und verstehe nicht warum hier nicht rüber geroutet wird – weil stärker abwerten kann ich die Straße kaum. In OpenMTBMap – warte auf jeden Fall nochmal auf das nächste Kartenupdate – ich korrigier da grad noch einige Autoroutingeinstellungen. Evtl ist da ein Wegstück fälschlich verboten. Ich hab gerade auch mal mit der neueste Basecamp Version gearbeitet – da wurde wieder was geändert. Benutz mal das Profil Dirt Biking (ohne Vermeidungen – bzw so wie oben angegeben) – das geht sehr gut. Ich muss mal schauen wie/was ich ändern kann um auf die neueste Basecamp Version das Routing besser hinzubekommen – bzw schauen welche Geräte Dirt Bike als Modus anbieten. Mit der neuen Kartenversion (29.07.15) und neuem Basecamp (4.5.0) haut alles hin. Beim Fahrradrouting wird jetzt komplett auf dem Radweg geroutet, ohne irgendwelche Verrenkungen (Dirt Bike oder so). Supi! I just joined up to VeloMap to help me route find in Puglia Italy for a three week cycling trip my wife and I are planning in Italy. My wife was not impressed when I managed to lead us onto the Kremser-Bundesstrasse last year while when cycling to Vienna 🙂 This year I wanted to be better prepared and signed up to your great service so our routes were safer and more enjoyable. Now since I am new to your map system, I thought I would try having Basecamp auto-route with Velomaps for areas that I am familiar with, namely British Columbia, Canada. I tried picking some areas that I knew well and that had well established bike routes between two towns. However when I used Auto-route, the Basecamp immediately designed a route that follows the nearest highway, ignoring all the secondary and residential roads. I have the Active Profile as Car/Motorcycle, and set for Faster Time, and only “avoid toll roads” selected. I have also tried setting “Shortest Time” but it doesn’t seen to help. You can see an example result in the attached screenshot where a route between the town of Parksville, BC and Qualicum Beach follows Highway 19 rather than the secondary roads and trails. Well I guess that’s in the US. The problem is that OSM is quite lacking there (and actually not only OSM – but the infrastructure for cycling itself is mostly really bad). If you would use “fastest time” it would probably route through quieter streets in the example – but basically the grey streets – are residential – in general (at least in Europe) they are not well suited for fast cycling (low priority on intersections – and so on). As for the tertiary roads in the screenshot – they are really not leading to your destination (and Garmin algos don’t like changing roads/streets – that’s something I cannot solve with my maps). So for what I see here – there really is no good route. Thanks for feed back. It certainly could be a North American problem as I agree the infrastructure for biking is poor here (although the West Coast has some good areas). I’ll try auto-routing again with the Austrian maps, as I know some of the touring routes there fairly well. That said, one thing that made me think I was doing something wrong was Google Maps actually found better routes than Garmin. For example, the attached Google route of the same area isn’t perfect, but it isn’t all on the Hwy 19 either (FYI the “official” bike route is on Hirst Ave to Renz Rd to Wembley and then follows Google’s suggestions). Since Google is usually a bad routing solution for bikes (IMHO), I thought Garmin/Velomaps would beat it cleanly. And this is just an example – I tried a number of routes out. But in the end I am looking for the really low traffic routes in Southern Italy, as the cycling in infrastructure there isn’t all the strong either (at least as I understand it). So grey streets would be ideal as they are both scenic and low traffic. Any way to make these the priority in the Garmin with your maps? Google Maps in the area don’t even offer the option of bike routes, so I am not complaining about Velomaps, just looking for the best results I can get. Well while google maps is rather strong in the US, but lacks in Europe – the result is not so suprising there. As for routing on small roads in South Tyrol – that should work out quite well I guess. In general there suitable roads exist. Overall Velomaps route better on the countryside compared to inside cities. I’m trying to plan my route through Turkey on Basecamp 4.4.4. There is the D400 trunk that crosses the whole country, and after i verified on other cyclotourists blogs, i can guarante it’s usable for bikes. My point is, i cannot plan routes using that trunk, whatever changes i make to the activity profile. I noticed you were writing about settings changes to another user (that setting being bicycle=yes). Where do i change that info ? Is it for that road only or general on all the map ? Is it MapSource only ? I have the same problems in Uzbekistan and Iran and cannot plan my biketrip as i have to ride those trunks (there is no other choice). I would like to tag those trunks as bicycle=yes but only for me and not on OSM. Is it possible ? If yes, how ? Well they are routable – but not allowed for routing. Hence avoided at nearly all costs. I will in January or February rework this with a per country default. Basecamp is quite loose on the restrictions – so it would be less likely blocked there. Even though I think adding bicycle=yes in OSM is okay – just as the per country defaults set in the wiki are not sufficient in all cases. So yes – some could consider the information superfluous – but I think it’s okay and noone will delete this. For highway=motorway I would definitely say this no matter what’s written in the wiki. Thats means i have to correct all those trunks in OSM for at least 5 countries (Turkey, Iran, Turkménistan, Uzbekistan, Kirgizistan + eventually Kazakhstan, China, …) and then wait until, based on those new infos, you republish an veloasia map. Thats very time consuming and i have to plan all my route before the end of the year… Thats what i wanted to avoid by using your maps… Isn’t there another way ? Or at least a way to circumvent this problem temporarily or only on the maps that are installed on my computer ? – It will be on Tomorrows Velomap – please try it out, I’m not sure if it really works correctly. (if you download the maps for Windows – you probably need to wait til Saturday for downloading). Thanks a lot for your very precious help ! I’ll re-downoad veloasia.exe on saturday and keep you posted asap about the results. By the way, the 3rd download for asia (veloasia.7z) is still reachable through the link you provided on another comment (ftp://ftp5.gwdg.de/pub/misc/openstreetmap/openmtbmap/odbl/velomap/continents/veloasia.7z)? Best regards and another big thank you !!! I just tested the veloturkey map with much better results. Thank you so much for your efforts, it helps me a lot !!! I’ll test veloasia in the next days and keep you posted. Asia is perfect too !! !